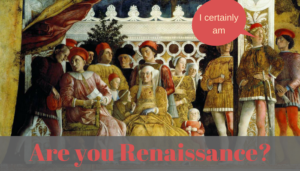 Are you Renaissance? Yes, You Are! You’ve heard the term “Renaissance Man” or “Renaissance Woman.” These are the people that have a ton of talents and several areas of knowledge. Sound like you? If you’re a meeting planner you absolutely are a Renaissance Person! Meeting planning requires a huge skill set. I took some time to create a list of skills that meeting planners should have – and Wow we are impressive. Take a look! Administrative Skills: Meeting planners can create and/or utilize spreadsheets, CRM databases, project management platforms, and perform all sorts of administrative duties. We are the force that knows that if it needs to get done, we are willing to dig in and get it done. Management Skills: We manage people, budgets, and projects. We create risk management plans. We manage relationships between stakeholders, vendors, attendees and staff. Some of us may also need to manage a human resource plan and/or a technical production. Communication Skills: We communicate with people on all levels and in many various types of businesses and areas of the world. There are upper management, staff, attendees, hoteliers, wait persons, valets and so many different types of people that we must be able to clearly communicate our plans and expectations. Meeting planners are masters at communicating to so many different types of people, it’s amazing! Designing Skills: We have an eye for design, whether that design be on paper, digital or event space. We send out mailers and invitations via paper, we have a say in design of event websites and social media visuals. We bring the look and feel of our event into the actual event space in everything from signs, décor, swag, entertainment and even meals! Marketing Skills: We market our events to so many different entities. We market it to our preferred venues where we wish to hold our events; we market to attendees to entice them to pay the fee to come to our event; and we market to vendors to become a part of our event. Training Skills: We are the leaders of our events, this calls for us train those that will be involved with our event on every level. Training could include our immediate staff, managers that will speak at our event, people who will work our actual event and more. Planning Skills: All the above must be planned. Not to mention meal plans, travel plans, content marketing plans, media plans and more. Finally, a few more skill to mention, we are quite adept at being absolutely, fabulously and wonderfully charming, we are a highly intuitive group and we are super likable!